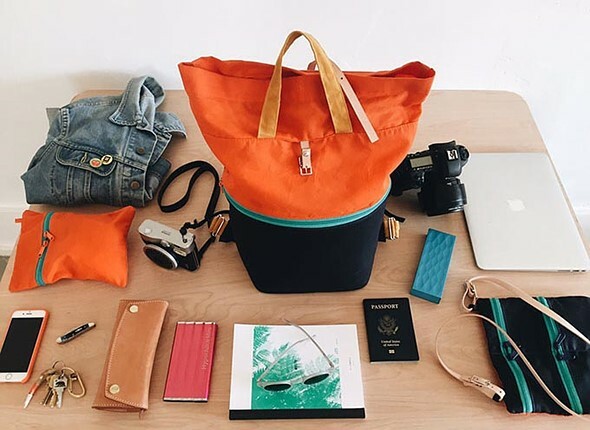 Tiny Atlas Quarterly, a travel publication, has launched a new multipurpose camera bag, Solas, on Kickstarter. The Solas bag is made from waxed cotton canvas, making it both lightweight and durable, designed to be carried as an arm tote, a backpack or a shoulder bag. The Solas bag measures 17in / 43cm high and 11in / 28cm wide, while the accessories bag measures 8.7in / 22cm by 8.7 / 22cm and the lens pouch measures 6.7in / 17cm wide. Solas is rain-resistant thanks to its waxed canvas exterior; it also features a pair of air-mesh organizer pockets and an internal key leash. The bag’s trim includes vegetable leather paired with metal buckles. An internal protective foam compartment is built-in for carrying cameras, while a padded sleeve can accommodate up to a 13-inch laptop. Additionally, Tiny Atlas says its bag features a cushioned internal frame for further gear protection. The bag is offered in three color schemes: Natural + Yellow, ‘Color Block,’ and Black. Tiny Atlas has reached and exceeded its $14,000 funding goal on Kickstarter, where it offers backers an early bird bag for $175, among other pledge options.